Fashion brand AllSaints has refreshed its technology strategy with Google technologies including Google Apps, Google Drive, and its social media tools to improve collaboration among the company's global creative teams and promote innovation. The retailer claims to be driven by experimentation and creativity, and constantly tests out new approaches to its style – including its photography, marketing videos, music sessions or even showroom furniture. According to AllSaints global innovation manager Dan Hartley, employees were burdened by a technology platform that made it hard to take creative risks or move quickly, but moving to Google Apps has transformed the way the retailer works. “Google’s tools help make our teams feel closer and more connected to each other – from the designers at AllSaints Studios in East London, to our factories and regional offices in Turkey, Portugal and Hong Kong, and our retail stores throughout the world,” Hartley wrote in a Google blog post. The employees no longer rely on email to request an up-to-date document, which meant waiting for a team member from another region to send it back as an attachment, only to discover their version is obsolete because someone else edited a different copy, he explained. Its 2,500 employees across 120 stores and 10 regional offices now store all their files in Google Drive, and can be confident they’re always working on the most up-to-date version. “This has also encouraged and developed a much more cross-functional working environment, leading to ideas and solutions that may have otherwise never been imagined,” said Hartley. Google Drive has also transformed how the retailer stores and shares files across the entire organisation. In its AllSaints Studios it used to have one shared network drive to store all of its files, which suffered from slow load times since so many people used it at once. “It got to a point where our photo department used a separate hard drive to handle their own large file formats,” said Hartley. But with Drive, everyone – including the photo department – can access documents anytime, without any performance issues, he added. The IT team encourages the use of desktop sync, an application installed on the computer that puts a Drive folder on the desktop to automatically store large files on computers as well. According to Google, all files uploaded to Google Drive are encrypted, not only from users’ devices to Google and in transit between Google datacentres, but also at rest on Google servers. Google Drive for Work was launched by Google in July 2014 at its I/O conference. The service is available for $10 per user per month. As of June 2014, it is estimated that Google Drive had 190 million monthly active users with enterprises such as HP, Seagate, Jaguar Land Rover, Travis Perkins and Crate and Barrel using it. 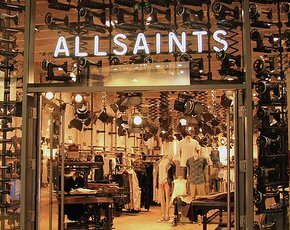 Additionally, AllSaints has embraced more Google technologies such as replacing its old intranet for retail managers with department-specific Google+ Communities for teams across its entire organisation. Each week, the creative artists release a set of directives that outline where to place new styles on the shop floor. Before moving to Google tools, the team published this information in a PDF on its intranet, and if anything changed during the week, retail managers would receive an email alert and have to find the file on the intranet, download it, then print a number of copies of the new version to hand out to their team. Now, they have a shared Drive folder for directives, and each manager can pull up the file from their tablet device as they walk around the shop floor, knowing what they’re looking at is always up-to-date. “We’ve found a technology partner in Google that improves our workflow and processes, and enables us to concentrate on the creative work. “With Google Drive, we have the tools at our fingertips to turn ideas into fashion, films and other works that inspire and ignite confidence and independence,” Hartley said. Other big UK brands that have used Google Apps include John Lewis and its sister brand Waitrose, Glyndebourne opera house and Travis Perkins.